Serenoa repens, commonly known as saw palmetto, is the sole species currently classified in the genus Serenoa. It is a small palm, growing to a maximum height around 7–10 ft (2.1–3.0 m). It is endemic to the subtropical Southeastern United States, most commonly along the south Atlantic and Gulf Coastal plains and sand hills. It grows in clumps or dense thickets in sandy coastal areas, and as undergrowth in pine woods or hardwood hammocks. Erect stems or trunks are rarely produced, but are found in some populations. It is a hardy plant; extremely slow-growing, and long-lived, with some plants, especially in Florida possibly being as old as 500–700 years. 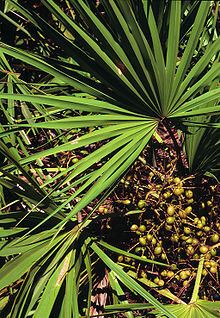 Saw palmetto is a fan palm, with the leaves that have a bare petiole terminating in a rounded fan of about 20 leaflets. The petiole is armed with fine, sharp teeth or spines that give the species its common name. The teeth or spines are easily capable of breaking the skin, and protection should be worn when working around a saw palmetto. The leaves are light green inland, and silvery-white in coastal regions. The leaves are 1–2 m in length, the leaflets 50–100 cm long. They are similar to the leaves of the palmettos of genus Sabal. The flowers are yellowish-white, about 5 mm across, produced in dense compound panicles up to 60 cm long. The fruit is a large reddish-black drupe and is an important food source for wildlife and historically for humans. The plant is used as a food plant by the larvae of some Lepidoptera species such as Batrachedra decoctor, which feeds exclusively on the plant. The generic name honors American botanist Sereno Watson. S. repens extract has been researched into treatment for people with prostate cancer. However, according to the American Cancer Society, "available scientific studies do not support claims that saw palmetto can prevent or treat prostate cancer in humans". A meta-analysis by the Cochrane Collaboration found that saw palmetto berry extract given therapeutically, even at double and triple doses, did not improve urinary flow or improve the prostate gland size in men with benign prostatic hyperplasia (BPH). Two large trials published between the newer and older meta-analysis found the extract to be no different from placebo. Although a 2016 review included trials with a special standardized extract of saw palmetto called Permixon. This suggests that the lack of an effect found in the most recent Cochrane review was due to the differences in the saw palmetto extracts used. Indigenous names are reported to include: tala (Choctaw); cani (Timucua); ta ́:la (Koasati); taalachoba ("big palm", Alabama); ta:laɬ a ́ kko ("big palm", Creek); talco ́:bˆı ("big palm", Mikasuki); talimushi ("palmetto's uncle", Choctaw), and guana (Taino, possibly). Saw palmetto fibers have been found among materials from indigenous people as far north as Wisconsin and New York, strongly suggesting this material was widely traded prior to European contact. The leaves are used for thatching by several indigenous groups, so commonly so that a location in Alachua County, Florida, is named Kanapaha ("palm house"). The fruit may have been used to treat an unclear form of fish poisoning by the Seminoles and Bahamians. Wikimedia Commons has media related to Serenoa repens. ^ "Serenoa repens". Germplasm Resources Information Network (GRIN). Agricultural Research Service (ARS), United States Department of Agriculture (USDA). Retrieved 12 April 2010. ^ Tanner, George W.; J. Jeffrey Mullahey; David Maehr (July 1996). "Saw-palmetto: An Ecologically and Economically Important Native Palm" (PDF). Circular WEC-109. University of Florida Cooperative Extension Service. Archived from the original (PDF) on 4 July 2008. ^ "Saw Palmetto". American Cancer Society. 28 November 2008. Retrieved 13 September 2013. ^ Tacklind, James; MacDonald, Roderick; Rutks, Indy; Stanke, Judith U.; Wilt, Timothy J. (2012). "Serenoa repens for benign prostatic hyperplasia". Cochrane Database of Systematic Reviews. 12: CD001423. doi:10.1002/14651858.CD001423.pub3. PMC 3090655. PMID 23235581. ^ Novara, Giacomo; Giannarini, Gianluca; Alcaraz, Antonio; Cózar-Olmo, José-M.; Descazeaud, Aurelien; Montorsi, Francesco; Ficarra, Vincenzo (2016). "Efficacy and Safety of Hexanic Lipidosterolic Extract of Serenoa repens (Permixon) in the Treatment of Lower Urinary Tract Symptoms Due to Benign Prostatic Hyperplasia: Systematic Review and Meta-analysis of Randomized Controlled Trials". European Urology Focus. 2 (5): 553–561. doi:10.1016/j.euf.2016.04.002. PMID 28723522. ^ Bent, Stephen; Kane, Christopher; Shinohara, Katsuto; Neuhaus, John; Hudes, Esther S.; Goldberg, Harley; Avins, Andrew L. (2006). "Saw Palmetto for Benign Prostatic Hyperplasia". New England Journal of Medicine. 354 (6): 557–566. doi:10.1056/NEJMoa053085. PMID 16467543. ^ Barry, Michael J.; Meleth, S.; Lee, J. Y.; Kreder, K. J.; Avins, A. L.; Nickel, J. C.; Roehrborn, C. G.; Crawford, E. D.; Foster Jr, H. E.; Kaplan, S. A.; McCullough, A.; Andriole, G. L.; Naslund, M. J.; Williams, O. D.; Kusek, J. W.; Meyers, C. M.; Betz, J. M.; Cantor, A.; McVary, K. T.; Complementary Alternative Medicine for Urological Symptoms (CAMUS) Study Group (2011). "Effect of Increasing Doses of Saw Palmetto Extract on Lower Urinary Tract Symptoms". JAMA. 306 (12): 1344–51. doi:10.1001/jama.2011.1364. PMC 3326341. PMID 21954478. ^ Austin, DF (2004). Florida Ethnobotany. Boca Raton, Florida: CRC Press. ISBN 978-0-8493-2332-4. ^ Whitford AC (1941). "Textile fibers used in eastern aboriginal North America". Anthropological Papers of the American Museum of Natural History. 38: 5–22. ^ Simpson, JC (1956). A Provisional Gazetteer of Florida Place-Names of Indian Derivation. Tallahassee: Florida Geological Survey. ^ Sturtevant, WC (1955). The Mikasuki Seminole: Medical Beliefs and Practices. Ann Arbor, MI: University Microfilms. This page was last edited on 20 January 2019, at 07:32 (UTC).